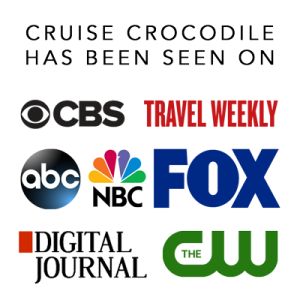 Our Warnemunde cruise port guide gives you information about the docking location, cruise dock, transportation options and much more! 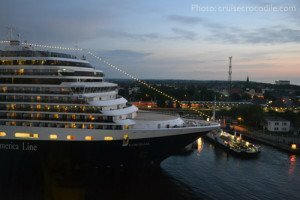 Welcome to the Warnemunde cruise port guide. 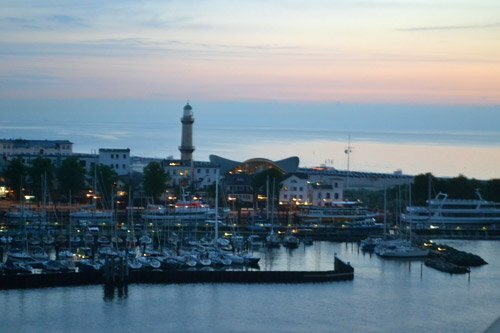 Get your all German experience here in this little coastal town of Warnemünde. It is a tiny town of 15.000. It is a suburb of Rostock. Year round it is fishing port and in summertime a seaside resort. When the sun is out this town will transform into one of the busiest areas of the country. The beach will be packed, the streets will be full of life and it becomes paradise in earth. Even if the sun will not show its face you still have nothing to be disappointed about. Warnemünde is the gateway to Rostock and Berlin. Rostock is a beautiful, charming Hanseatic town that used to be one of the most important trading posts on the Baltic during the middle ages. It grew strong and wealthy because of the trade and you can still see witness the wealth of this league today. Berlin is the capital city of Germany. It takes about 3 hours to get to from Warnemünde, but it will be worth your while to get a glimpse of this immense city that offers some of the most unique sites in Europe. This is the dock at the cruise terminal Warnemunde. At the Warnemunde cruise dock you will find a high end cruise terminal. How are you? – Wie geht es dir? To check where your ship will dock go to: http://www.rostock-port.de/en/cruise-shipping/port-calls/. P7 and 8 is the dock at the cruise terminal in Warnemünde. P1 to 6 is located in front of the cruise terminal and train station and is only available for small ships. The other docks are actually not in Warnemünde but in Rostock. The information underneath only applies to the docks in Warnemünde (dock P1 to P8). The port of Warnemünde is the mouth of Warnow and the port area of Rostock. From here it is less than 1 km walk to the centre of town. As you exit the port you will head right and in a few hundred yard you will go into a tunnel that goes underneath the train station. As you come out on the other end you are in the centre of Warnemünde. Here you will find the train station, tourist information, bicycle rental and harbour cruises. When your ship is docked you will see there are train tracks in front of the cruise terminal. The train station is actually just a couple of hundred yards to the right hand side (looking at the tracks from the ship). You will see there are regular service to and from Rostock as well as Berlin. Plan any train ride through the website www.db.de You can buy the tickets for the train at the tricky machine or easily at the counter for just a few euro. Do know that you need to validate your ticket before you get into the train. Do this by punching the ticket in the machines on the platform. The main trainstation in Rostock is Rostock HBF. This station is still 2 km from the city centre. From the train station you can take the tram 5 or 6 to stop “Neuer Markt” (Rostock city centre). Find the tram stop underneath the train station. Taking the train from Warnemünde to Berlin takes between 3 and 4 hours and costs between 40 and 50 euro one way. The train schedule is pretty infrequent. Always plan your journey ahead of time through this website: http://www.deutschebahn.com/en/start/. The train station to choose are Warnemunde and Berlin Hbf (main train station). Because Berlin by train is time consuming we would recommend planning this journey ahead and maybe even consider other options like shore excursion or taxi. Near the tourist information in town you will find a bicycle rental facilities. See map above for its exact location. You will find the area is ideal for biking especially on a nice day. Right next to the dock you will find local ferries that service the locals but also sightseeing tours through the harbour of Rostock. See map above for its exact location. The cost for a 100 minute cruise is between 10 and 15 euro per person. There are usually taxis available at the port. Negotiate a price before you step in. Expect a taxi to Rostock will cost you about 20 euro one way. Just across the port there is a car rental available. Sometimes there is also a representative present in the terminal building. In the St. Mary’s church in Rostock you will find this very unusual piece of science and art. It is the astronomical clock that has already been standing here since 1472 and ticking for over 500 years. Learn more about this beautiful piece and other works of art in the church. Sachsenhause was a Nazi concentration camp in Germany. It was build in 1936. When the camp was liberated in 1945 it would still operate as NKVD special camp nr. 7 by Stalinist Soviet occupied forces. Ten thousands of people would die on this small piece of land during these two decades of brutality. Visit Sachsenhausen and learn about the hars conditions of life and death of the prisoners. Find this concentration camp just north of Berlin. From the port it is about 2 hrs drive south. Warnemunde is a beautiful little town that lights up as soon as the sun starts shining. In town you will find the beach, the lighthouse, teepott and canal to explore. The Warnemunde cruise dock is located just south of the city center. The dock offers a cruise terminal with a few facilities. From here it is an easy walk to the small center of town and the train station. The Warnemunde Cruise Center can accomodate 2 cruise ships at the time and is a popular cruise destination in the summer time. 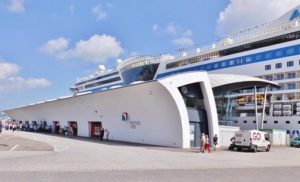 Read all about the cruise dock facilities in the full Warnemunde cruise port guide. Rostock is an easy 15 minute train ride away from Warnemunde. It is a town with 800 years of history. It is an old member of the Hanseatic League, which used to be the “European Union” of the middle ages. Find all kinds of architecture styles here like this 13th century city hall you see on the picture. A colourful mix of gothic and baroque. This 13th century capital of Berlin is something unique to explore. It is a gem of museum and sights that do not match any other city in Europe. Visiting Berlin takes some time from Warnemunde, but it will be worth your while. See the description above to find out how to get to Berlin from Warnemunde. Make sure you are on an outside deck when approaching the port! You’ll have a nice view over Warnemunde when sailing in.